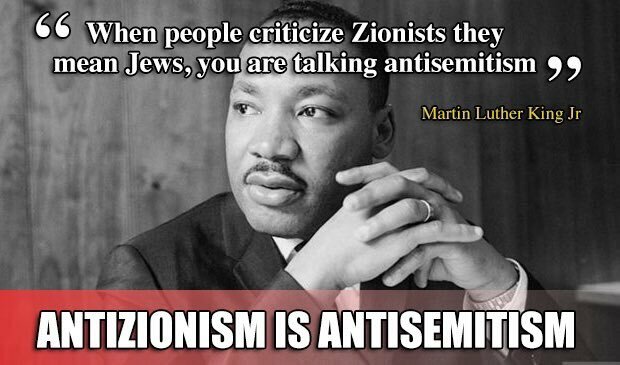 Did Martin Luther King believe criticising Zionists is antisemitic? All the same, Lipset’s report that he attended a dinner with King is undoubtedly correct. As Martin Kramer has convincingly established, citing contemporary correspondence from the King Center archives, the event took place in October 1967 at the Cambridge, Massachusetts home of future New Republic owner/editor Marty Peretz and his wife Anne, who as the wealthy heiress to the Singer Sewing Machine Company fortune had been a generous donor to the Southern Christian Leadership Conference, the civil rights organisation of which King was co-founder. The context to the dinner, as Kramer points out, was the emergence of militantly pro-Palestinian, anti-Zionist sentiments among younger black activists in reaction to the Six Day War of June 1967. The Student Nonviolent Coordinating Committee’s newsletter had featured a centre spread on “The Palestine Problem”, which expressed forceful opposition to Israel as an imperialist-backed state originating in ethnic cleansing (it cited the role of the “terror gangs” of the Irgun and Lehi) but undermined its case with allegations about the sinister role of Jewish bankers. Marty Peretz, who like Lipset was strongly pro-Israel, had denounced the SNCC article for its “vicious anti-Semitism”. This was followed by the Chicago convention of the National Conference for New Politics, which Peretz was centrally involved in organising, where the Black Caucus provoked a furore by presenting a motion that called for condemnation of the “imperialist Zionist war”. The Southern Christian Leadership Conference later issued a statement rejecting this as “simplistic” and emphasising the role played by their members in getting the motion amended. When Marty Peretz referred in his invitation letter to King to the need for “some honest and tough and friendly dialogue” about developments over “recent months”, this was no doubt what he had in mind. The large presence of African-American students among the guests suggests that one purpose of the Peretzes’ dinner was to bring King’s moderating influence to bear on those who might be influenced by the SNCC/Black Caucus line on Israel. So there is no dispute that the dinner took place, or that the Arab-Israeli conflict would likely have played a prominent part in the discussion. What is questionable, though, is the reliability or for that matter the meaning of Lipset’s quotation from King (“When people criticize Zionists, they mean Jews”). Kramer claimed that Lipset “preserved King’s words … by publishing them soon after they were spoken”. But Lipset’s account was in fact published over two years later, in the December 1969 issue of the CIA-funded magazine Encounter. (In the US the article, titled “‘The Socialism of Fools’: The Left, the Jews and Israel”, was also published as a pamphlet by the Anti-Defamation League, who have become notorious for conflating opposition to Israel with antisemitism.) While Lipset probably recalled the general thrust of King’s remarks accurately enough, unless he took shorthand notes it is far from certain that he was able to provide a verbatim quote. Questioning whether Lipset had memorised the precise wording of King’s intervention doesn’t commit us to the view that he fabricated the story of an argument between King and an African-American student in which King rebuked the student for his attack on Zionists. This incident almost certainly took place. The problem is that Lipset’s version of King’s response is open to the interpretation that King went further than just countering the arguments of one pro-Palestinian student, or indeed of the SNCC and Black Caucus — he appeared to be asserting that any criticism of Zionists is automatically antisemitic. Which of course is why the quotation is so popular with Zionists. But does that reflect King’s actual position? It is true that King did express his admiration for the state of Israel. Speaking at the annual convention of the Rabbinical Assembly shortly before his murder, he described Israel as “one of the great outposts of democracy in the world, and a marvelous example of what can be done, how desert land can be transformed into an oasis of brotherhood and democracy”. While this may seem naive today, such illusions were not uncommon in progressive circles at the time, at least among the older generation. Whether King would have maintained this rosy view of Israel in the face of subsequent developments we shall never know. In any case, and this is the relevant point here, King’s sympathy for the Zionist project was far from uncritical. On the eve of the Six Day War, King put his name to a statement that was published as an advert in the New York Times. It warned that the Middle East was “on the brink of war”, blamed the Arab world for the escalation of tensions, and called on the people and government of the US to “support the independence, integrity and freedom of Israel”. However, as Murray Friedman recounts in his 1994 book What Went Wrong? The Creation & Collapse of the Black-Jewish Alliance, in subsequent discussions with his advisers, as recorded by FBI wiretaps, King “admitted to being confused. He had never actually seen the ad before it appeared, he told them. When he did, he was not happy with it. He felt it was unbalanced and pro-Israel”. King expressed particular concern over a news report in the NYT that had described the statement as a “total endorsement” of Israel. That clearly was not a position he held. Friedman goes on to note, and Martin Kramer himself has added further details, that as a result of the Six Day War, King cancelled a planned speaking tour of Israel. He did this despite preparations being well advanced, with his impending “pilgrimage to the Holy Land” having been announced at a press conference and some six hundred people having paid their deposits to accompany King on his visit. King justified the decision to cancel on the basis that he didn’t want to be seen as offering public support for Israel’s policies in the immediate aftermath of a war against its Arab neighbours. In a discussion with his advisers (again we have the details courtesy of the FBI’s wiretaps) King stated: “I just think that if I go, the Arab world, and of course Africa and Asia for that matter, would interpret this as endorsing everything that Israel has done, and I do have questions of doubt.” He added: “Most of it would be Jerusalem and they have annexed Jerusalem, and any way you say it they don’t plan to give it up.” Under those circumstances, King argued, to continue with the proposed Israel visit “would be a great mistake”. This was in July 1967, just three months before King attended the dinner at the Peretzes’ house. Do those sound the words of a man who believed that any criticism of Zionists is by definition antisemitic? Taking into consideration King’s response to the Six Day War, Kramer concludes that “it is an offense to history, if not to King’s memory, whenever someone today summons King’s ghost to offer unqualified support to Israel….” Whether Kramer’s advice will have any influence on those Israel apologists who are intent on using the Lipset quote to falsely equate criticism of Zionism with antisemitism is another matter. Next Post Where are Cameron’s ground troops?